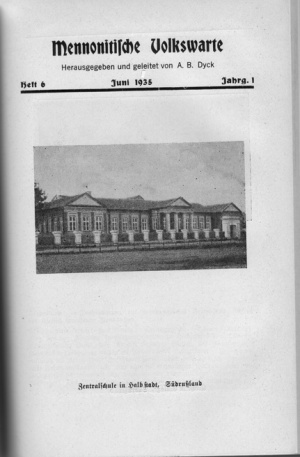 Difference between revisions of "Mennonitische Volkswarte (Periodical)"
[[File:MennonitischeVolkswarte.jpg|300px|thumb|right|''Mennonitische Volkswarte, June 1935 issue'']] <em>Mennonitische Volkswarte</em> (After 1937 <em> Mennonitische Warte), </em> an illustrated monthly magazine of 32-40 pages, was published and edited for four years (1935-38) by [[Dyck, Arnold (Abram Bernhard) (1889-1970)|Arnold Dyck]] at East Kildonan, Man. The magazine made a unique contribution in making full use of Mennonite art, photography, fiction, poetry, etc., for the first time in American Mennonite history, in presenting the various aspects of culture of Mennonites of German background. Many of its contributors, like the editor himself, were writers, artists, and teachers. The magazine placed more emphasis on the cultural aspect than the specifically religious, which is taken care of in the traditional Mennonite publications. The magazine built up a storehouse of information during its brief existence and influenced and inspired <em> [[Mennonite Life (Periodical)|Mennonite Life]]. </em> Lack of support and sufficient circulation made it necessary for the publisher, who sacrificed heavily, to discontinue its publication. The <em> [[Warte-Jahrbuch für die Mennonitische Gemeinschaft in Canada (Periodical)|Warte-Jahrbuch]] </em> followed the same pattern, but likewise did not survive.
'']] <em>Mennonitische Volkswarte</em> (After 1937 <em> Mennonitische Warte), </em> an illustrated monthly magazine of 32-40 pages, was published and edited for four years (1935-38) by [[Dyck, Arnold (Abram Bernhard) (1889-1970)|Arnold Dyck]] at East Kildonan, Man. The magazine made a unique contribution in making full use of Mennonite art, photography, fiction, poetry, etc., for the first time in American Mennonite history, in presenting the various aspects of culture of Mennonites of German background. Many of its contributors, like the editor himself, were writers, artists, and teachers. The magazine placed more emphasis on the cultural aspect than the specifically religious, which is taken care of in the traditional Mennonite publications. The magazine built up a storehouse of information during its brief existence and influenced and inspired <em> [[Mennonite Life (Periodical)|Mennonite Life]]. </em> Lack of support and sufficient circulation made it necessary for the publisher, who sacrificed heavily, to discontinue its publication. The <em> [[Warte-Jahrbuch für die Mennonitische Gemeinschaft in Canada (Periodical)|Warte-Jahrbuch]] </em> followed the same pattern, but likewise did not survive. Mennonitische Volkswarte (After 1937 Mennonitische Warte), an illustrated monthly magazine of 32-40 pages, was published and edited for four years (1935-38) by Arnold Dyck at East Kildonan, Man. The magazine made a unique contribution in making full use of Mennonite art, photography, fiction, poetry, etc., for the first time in American Mennonite history, in presenting the various aspects of culture of Mennonites of German background. Many of its contributors, like the editor himself, were writers, artists, and teachers. The magazine placed more emphasis on the cultural aspect than the specifically religious, which is taken care of in the traditional Mennonite publications. The magazine built up a storehouse of information during its brief existence and influenced and inspired Mennonite Life. Lack of support and sufficient circulation made it necessary for the publisher, who sacrificed heavily, to discontinue its publication. The Warte-Jahrbuch followed the same pattern, but likewise did not survive. Krahn, Cornelius. "Mennonitische Volkswarte (Periodical)." Global Anabaptist Mennonite Encyclopedia Online. 1955. Web. 25 Apr 2019. http://gameo.org/index.php?title=Mennonitische_Volkswarte_(Periodical)&oldid=92783. Krahn, Cornelius. (1955). Mennonitische Volkswarte (Periodical). Global Anabaptist Mennonite Encyclopedia Online. Retrieved 25 April 2019, from http://gameo.org/index.php?title=Mennonitische_Volkswarte_(Periodical)&oldid=92783. Adapted by permission of Herald Press, Harrisonburg, Virginia, from Mennonite Encyclopedia, Vol. 3, pp. 648-649. All rights reserved.